PMI’s 2015 report, Delivering on Strategy: The Power of Portfolio Management, found that organizations that have mature project portfolio management practices in place gain a significant advantage over competitors in that they “complete 35 percent more of their programs successfully, fail less often and waste less money.” PfMPs are rare, having only been in existence since May 2014 and as of January 2019 there are 625 PfMP certification holders in the world. PMO Advisory is a leader in project portfolio management with offerings across training (for knowledge and application), boot camps (for passing the PfMP exam), and consulting services. On PfMP exam preparation, we also offer the widest range of products and services, suitable for all budgets – free to platinum service. PfMP Real-Time, Expert-Led Bootcamps starting @ $959! Our PfMP Certification Training Bootcamp is coming to Los Angeles January 16 & 17, 2020. Sign up to receive news and information, early bird special discounts, and invitations to free webinars surrounding this course! Sensible Guide to Passing the PfMP. Available on Amazon.com. Implementing Project Portfolio Management. Available on Amazon.com. Webinars. Visit www.pmoadvisory.com/webinar for our monthly webinar series, which includes a number of portfolio management related topics. Course Description: Studies have consistently shown organizations today fail to implement their strategies. The failure rate differs among studies, but even the most optimistic puts the failure rate at 50% with some studies showing as high as 90%. One of the primary reasons for strategy implementation failure is poor project investment selection and poor organizational focus. This results in significant waste and ineffective use of precious assets and resources. Confronting the issue of investment selection and prioritization as well as limited resources, organizations must work “smarter” by focusing their limited resources on the most important and highest priority endeavors. PMI created the PfMP credential in 2014 mainly focused on addressing this major gap in organizational project management. Portfolio management is commonly viewed as the apex of the project management professional ladder. Portfolio managers often plan mid- to upper-level leadership roles, working with business executives to influence and determine project investments. The PfMP certification provides the necessary credential and credibility to be at the same table with senior executives. Course Description Our Full 2 Day PfMP course is real-time, certified expert-led classes delivered in a traditional classroom setting. The course is comprehensive using multi-modal learning including lecture, class discussions, case studies, hands-on exercises (individual and group), and questions and answers. The course content is based on PMO Advisory’s consulting methodology and it is mapped to the Portfolio Management Examination Content Outline (ECO). The benefits for participants are immense. Not only will the participants learn to pass the exam (which to date our participants have achieved a 100% pass rate on the 1st attempt), they will also learn how to apply the principles, tools, and techniques. Application review (a la carte; included in all-inclusive package). * Must be purchased at the same time as the Base Package. Who will benefit from the course? : As the PfMP certification is the most elite PMI qualification, credential holders will gain a distinct advantage in employment and promotional opportunities over their peers and this course is ideally suited for current program, project, and portfolio managers, along with VPs/AVPs, PMO Directors / PMO consultants. 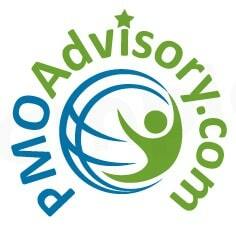 PMO Advisory can also assist with application review. We will assign a PfMP certified professional to work with you. This is a standalone service (with the exception of all-inclusive package). Important: This is a resource-intensive service, and we only offer this as a part of our PfMP Bootcamps. We also had instances in which the English language was problematic. Thus, we reserve the right to reject candidates for this service. Discounts: We offer a range of discounts, from 20% for Early Birds to special discounts for Veterans, Non-Profits. We even have a “value-exchange” program in which professionals can “barter” their time for a discounted fee. Click here for more information. We have the most comprehensive resources – 560+ slides in the bootcamp workbook, 1800+ questions, 3 books, readiness exam, LinkedIn support group, job aids, etc. For more reasons, see Why PMO Advisory? (Long Version). Once you start to achieve 70%+, start using the Exam Mode when you have four hours. You may also wish to schedule the actual exam. Depending on your schedule, our recommendation is two weeks out. Within the next week, practice using the Exam Mode as often as you have time. You know you are ready when are able to achieve 75% or higher. Everyone who had achieved 75% or higher in our Exam Simulator in Exam mode two consecutive times within the 7 days and takes the exam within the next 7 days actually never failed the exam. But for the Money Back Guarantee to apply, as our “skin is in the game”, the threshold is set at 85%. Course Description: Our Intelicamps are real-time, certified expert-led classes delivered virtually to a global audience in real time. It consists of highly accelerated, condensed multi-day training materials delivered in three sessions of four hours each. In the PfMP Intelicamp, we bundle the largest PfMP test bank known in existence with over 1,700 questions. We also provide up to 12 months of support in which participants can attend additional sessions completely free. Click here to understand why we believe our Intelicamp is the most effective way to learn virtually. To support the growth of the Portfolio Management profession, PMO Advisory offers a range of “do-it-yourself” services to assist in the preparation of the PfMP exam. LinkedIn Forum – Achieve PfMP! 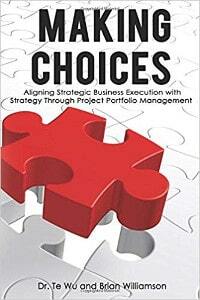 Making Choices – A fictional book about a portfolio manager confronting real-life challenges. Through storytelling, our hope is that this book will provide readers with a realistic mindset to tackle the exam questions. Implement Project Portfolio Management: A Companion Guide to the Standard for Portfolio Management – Our CEO was a core team member of the Fourth Edition. Here, working with seven of the other core team members, they created a guide to assist with the implementation. This book is also invaluable for exam preparation. This course is a bundled product that includes: 1) A recent recording of our live-virtual bootcamp (about 12 hours of video) and 2) Full PfMP Exam Simulator with over 1,700 practice questions in both Flexible and Exam Mode. The PfMP Readiness Assessment is designed to evaluate your readiness for the PfMP exam. This can also be used as a “pre-test”. Click here to access the assessment. Upon completion, we will email you a more detailed report of your performance. To support portfolio management professionals, PMO Advisory introduced the first and largest test bank of PfMP practice exams. We have over 1,700+ questions in the full PfMP Exam Simulator for our bootcamp participants. But we have also created a library of about 780 questions for DIY professionals. To get started, simply click on one of the plans below and pay with a credit card so you can gain immediate access. Due to system limitations, you would need to pay for each of the exams separately. Sample test in Flexible Mode (for practicing) contains 10 questions pulled from a large test bank. It is a good way to evaluate your readiness. Sample test in Exam Mode pulls questions from the same test bank but in a forum that is closer to the actual exam. Full Test in Exam Mode (170 questions in 4 hours for $75) – Three attempts only for 10 days access. The goal is to achieve 85% or higher before taking the exam. Important: The Exam Mode is designed for professionals who are “almost ready” for the actual exam and wishes to practice in a simulated exam mode. If you are still studying and practicing, please consider the Flexible mode which has unlimited access for 90 days. Participants can earn an additional 6 PDUs (4 Technical; 1 Leadership; 1 Strategic) by practicing using our PfMP Exam Simulator. Please note that we have seen cases of suspicious activities pertaining to the use of our exams. If we find such behaviors, we reserve the right to cancel your plan immediately. Thank you for your understanding. To buy this book at Amazon.com, please click HERE. As a recent portfolio manager leading the enterprise portfolio management office (PMO) of a growing consulting firm, Isabella Garcia found herself confronting a series of real-world firestorms that includes: poor adoption of new knowledge management (KM) systems, punishing schedule changes on mission-critical projects, managing difficult resources and capacity challenges, attracting strong talents to her team, prioritizing projects within the portfolio, determining requirements in an enterprise resource planning (ERP) implementation, managing up, down, and across the organization, and leading a merger and acquisition (M&A) endeavor. As a contemporary woman, Isabella is also confronting the challenges of balancing life, work, and more work. This a fictionalized business book based on actual and highly relevant situation that many project professionals, especially portfolio management professionals will face. The book is vital and relevant for those who aspire to complete the Project Management Institute’s Portfolio Management Professional (PMI PfMP) credential as one of the requirements is an experienced-based examination. Isabella’s many firestorms provide insights on the actual role of a portfolio manager and greatly enhance both the understanding and application of project portfolio management. We create a community of our portfolio managers, and it is the fastest growing of its kind on LinkedIn. There are now over 700 members. Click here to access the forum and request to join. 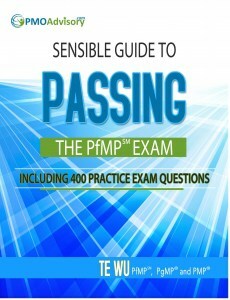 The Sensible Guide to Passing the PfMP Exam, Including 400 Practice Exam Questions Click here to download the table of content with sample pages. You can also purchase this book on Amazon.com in print or Kindle. This book is designed to guide busy project professionals with the preparation and passing the PfMP exam, which is especially difficult due to the amount of experience required to qualify and pass the exam. Unlike other related books, this book discusses the fundamental questions of why, provide lesson plans and study aids, and presents additional tools and techniques for portfolio management. The first book on this top that is written by a certified portfolio manager. One of the few (perhaps the first) to license intellectual property from PMI. Presents a time tested system to passing the exam with shortcuts, exam aids and 400 practice questions. More than a test guide. It is like a companion guide that advances project portfolio management. Business Executives – Part 1 of the book includes Chapter 1, which provides a comprehensive but high-level description of portfolio management, including the what, why, who, and how. 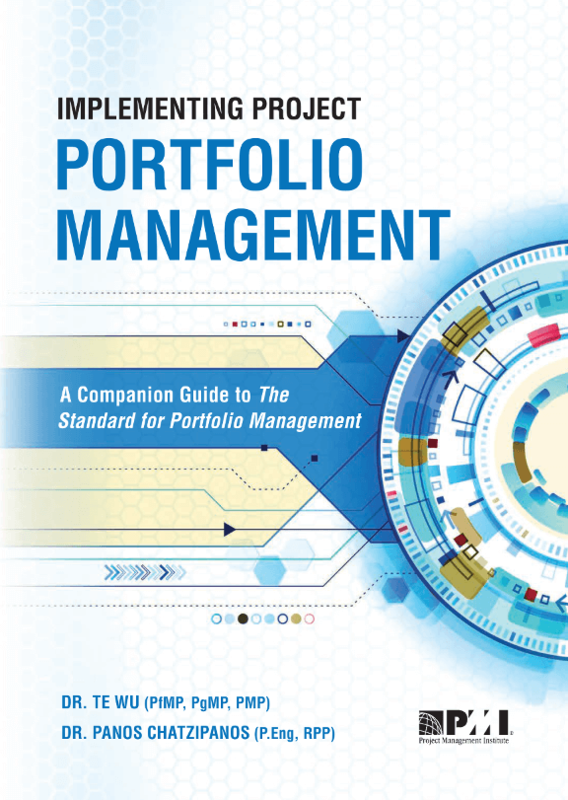 Portfolio Leaders and Practitioners – Part 2 of the book, Chapters 2 to 8, offers an in-depth examination of the various performance domains discussed in the Standard for Portfolio Management – Fourth Edition. In addition, this book goes beyond the standard with additional domains and concepts that are in practice today. Portfolio Thinkers – Part 3, the final chapters, is designed for tinkerers and inquisitive professionals who want to look ahead and see the future of portfolios and some areas of the latest development. Part 3 is a true work in progress. To buy this book on Amazon.com, please click HERE. About the Exam The PfMP exam is part of a four-week credentialing process that leads to a professional portfolio management credential from PMI. The exam contains 170 multiple-choice questions that are divided into five domains, including strategic alignment, governance, portfolio performance, portfolio risk management and communications management. Test takers have four hours to complete the certification exam, which can be taken after an initial application review and evaluation from a panel of portfolio managers. Portfolio Management Experience: Number of Hours: The application will ask you to record the number of hours of your tasks in five portfolio management divisions. Keep in mind that the required hours must be parallel to your educational attainment. A Brief Outline of Your Portfolio Management Experiences: As stated, in-depth details are required when documenting your portfolio management experiences. You have a maximum of 500 words—make sure you are clear and concise. Application review: PMI will review your application for completeness, evaluate your skills, professional experience, as well as how you respond to a series of questions. Fees: Exam fees are based upon PMI member status. The exam for PMI members is $800, non-members pay $1,000. Audit: Though not common, it is possible that your submitted application can be audited as all applications are subject to be audited. If you are randomly selected for audit you will have 90 days to submit supporting documentation that includes diplomas, and signatures of supervisors for all of the projects and programs listed on your application. PMI will review your audit as soon as they receive it. If you are audited and complete the audit successfully you will move on to the panel review. Panel review: The panel review will assess professional experience based on your responses to the Portfolio Management Experience Summaries on the application. The review panel is made up of portfolio managers selected by PMI. Each of the panel members is subject matter experts in portfolio management and trained by PMI to evaluate your experience. In order to avoid bias, your identity and location are kept confidential throughout the process. The review will verify that you have directly independently managed one or more portfolios. Failure to clear the panel review means that you will be contacted to discuss your status and what you will need to do or improve upon before applying again. Passing the panel review means you are cleared to sit for the exam. PfMP exam: Once you clear the review panel you will have up to one year to sit for the exam. You will have 4 hours to complete the exam which is computer-based and consists of 170 multiple-choice questions. 150 questions are scored, while 20 are non-scored pre-test questions placed randomly throughout the exam. You are permitted to take a break if you need one, unfortunately, there are no scheduled breaks and any time used taking a break eats into your exam limit time. If you fail the exam you can retake it two more times during the 12-month period following clearing the panel review. The PfMP® certification exam targets five domains, all have corresponding tasks to complete. The questions are situational and the responses have to be based on the processes defined in PMI’s Standard for Portfolio Management. 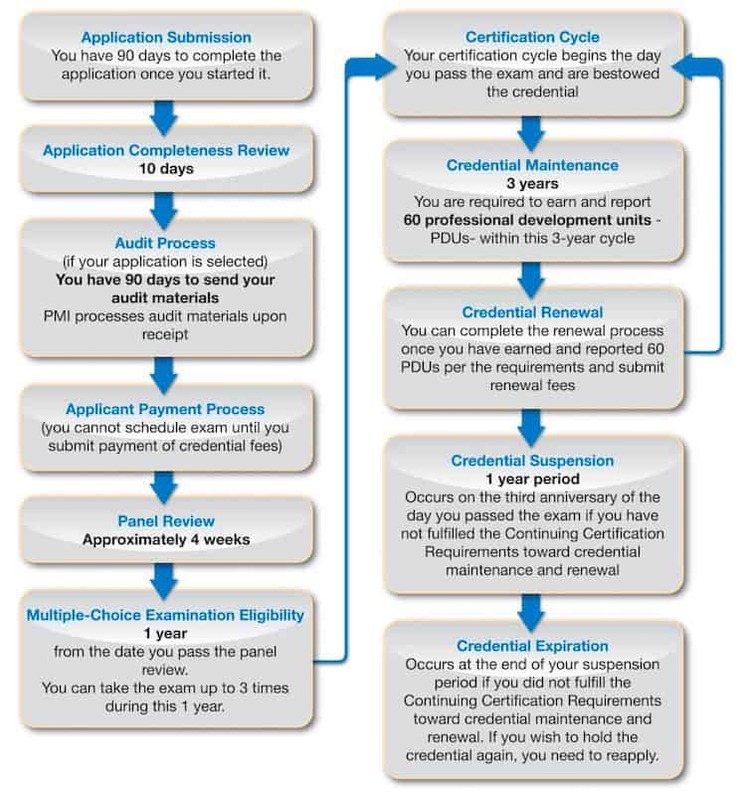 The next PfMP® certification timeline is for those who have passed both the examination and panel review. Maintenance – Up to 3 years. You are required to earn 60 professional development units (PDUs) within that 3-year cycle. Renewal – This is only available when you have earned your 60 PDUs, as well as renewal payment. Suspension- This happens in the third year from passing your PfMP® exam. The suspension happens when you failed to submit the continuing certification requirements for renewal and maintenance. Expiration – Same situation as stated above. You need to reapply in order to renew your expired credentials. What is a Registered Education Provider (R.E.P) ? PMO Advisory is a R.E.P. #4172. PMI R.E.P.s are organizations that are approved by the Project Management Institute to offer training in project management and issue professional development units (PDUs) to meet the continuing education requirements needed by PMI credential holders. To earn the R.E.P. designation, a provider must meet or exceed rigorous standards for quality and effectiveness as defined by PMI. When it comes to Portfolio, Program, or Project Management training it’s sensible and prudent to make sure the training firm is a PMI R.E.P. There is a difference! About Portfolio Management: Portfolio Management is the application of management activities to a collection of programs, projects and/or operations to achieve strategic business objectives. Thus Portfolio Management is not just about ensuring profits but cohesively binding projects within the portfolio, so that they work in tandem to achieve global goals of the organization. The PfMP certification is an elite certification offering from the Project Management Institute. PfMP credential holders are recognized for their advanced experience and the skills necessary to manage and align a portfolio of projects and programs to realize organizational strategy and objectives. PfMP professionals oversee the success of one or more portfolios, balance conflicting demands between programs and projects, and allocate resources based on organizational priorities and capacities. Portfolio Management is generally viewed as the apex of the project management career ladder. Unlike program and project management that mainly concentrates on “how”, portfolio management addresses the question of “why” and “what”. As a Portfolio Manager, you would be required to manage various aspects such as time, cost, and resources by applying portfolio management best practices. What makes PMO Advisory the Best Choice for your Project Management Training and/or Consulting needs? The company is founded by a project management insider. 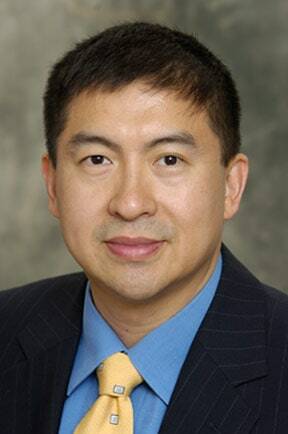 Prof, Dr. Te Wu holds the following PMI certifications: PfMP, PgMP, PMP, and PMI-RMP (Portfolio, Program, Project and Risk Management, Professional) credentials. Prior to starting PMO Advisory, he was the head of the global project services at one of the Big 4 tax, audit, and advisory firms. Complementing his practical experiences, he is also a quasi-academic who taught as an Assistant Professor at Montclair State University and a Visiting Professor at China Europe International Business School (CEIBS, ranked #1 in Asia). Te founded PMO Advisory LLC, a management training and consulting firm that specializes in strategic business execution including portfolio, program, and project management. Hence the foundation of PMO Advisory is rooted in project management expertise coupled with educational attainment. We are uniquely capable as we serve the full spectrum of project management (portfolio, program, and project management) and leverage that in our consulting and advisory services. We’re experienced professionals. We speak human. We don’t clutter our communication with consultant-speak designed to make frameworks more difficult to understand than they or your issues are. We prefer to keep our language and our solutions friendly, simple and effective. You’re not just hiring another training or consulting firm, you’re partnering with experienced professionals who will not only meet, but exceed, your expectations. We provide effective education that is grounded in years of successful application, not opinion or personal preference. We focus on what makes our clients successful. We care about your success. YES, we really do! We don’t just get to know you or your business, we take a sincere interest and genuinely want to help you and or your business realize lofty goals. We want to know all about your vision for your career and/or company. We personally invest ourselves in each trainee and every project we work on. Our programs will provide you and your business with a clear road map to success. We’ve done our homework. We’re extremely knowledgeable about serving busy people with busy lives and training trends. We embrace contemporary learning initiatives because we’ve seen first-hand the fantastic results that they produce. 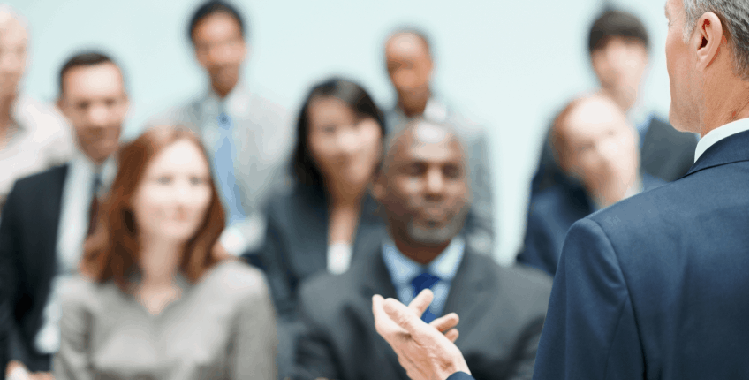 Whether you’re looking for a hybrid training of online and in-person / in classroom; whether organizational training or executive coaching or leadership training, you can be sure PMO Advisory is educated on a variety of solutions to meet your needs. We are committed to quality. We don’t settle for anything but the best, and neither should you when it comes to training. We’ve worked hard to find the best ways to provide our clients with affordable project management training programs and reasonable scheduling options without sacrificing the quality of our services. We’re flexible, agile and cost-effective. Because we are a small firm, we’re also responsive, flexible and agile. We adapt as your needs change, with speed, efficiency, and cost-effectiveness that larger firms just can’t match. PMO Advisory does more than just deliver our project management training and management programs to you. We also make sure that the resources in your organization who will be implementing the programs know exactly how they work, why they work and how to help them evolve. We will make sure you’re set up for success before our work is done! Our client satisfaction commitment. A positive client service experience which meets (and ideally exceeds) your expectations is the goal behind all of our business interactions. Continually improving our service experience is the cornerstone of our operations. Measurement and feedback are critical to achieving these goals. We continually collect client feedback — formal and informal; both good and not-so-good — and share it across the company. When the feedback is good, our employees are motivated to repeat and improve on their performance. We offer a wide range of business execution and project management training. Click here for more information. For our business and institutional clients, we offer onsite training at the client location. The course can be customized between 2 to 5 days. Two days are generally designed as accelerated instructions for experienced professionals, and five day courses offer more time for exercises. Our general recommendation is 3 or 4 days. Three Day – This is an accelerated program designed for experienced project management professionals. If your organization has strong portfolio managers who have limited time, this is the most effective course. Four Days – This is the best course for most organization, and it is usually our recommendation. Beyond the Three Day, which is fast paced, this course provides more time for reviewing key concepts, practicing sample tests and conducting Q&A. Five Days – This is an extended course for organizations and professionals who wish to spend more time on tools, techniques, and templates. This course is more than just passing the exam. Most importantly, assuming you do your share of studying, you will have unlimited access to above for up to a year. As a discipline, project management is both “deep” and “broad”. It is deep because project execution is managed at a detailed level; this means effective project managers must go beyond the knowledge in PMBOK® Guide – Sixth Edition and the other standards. 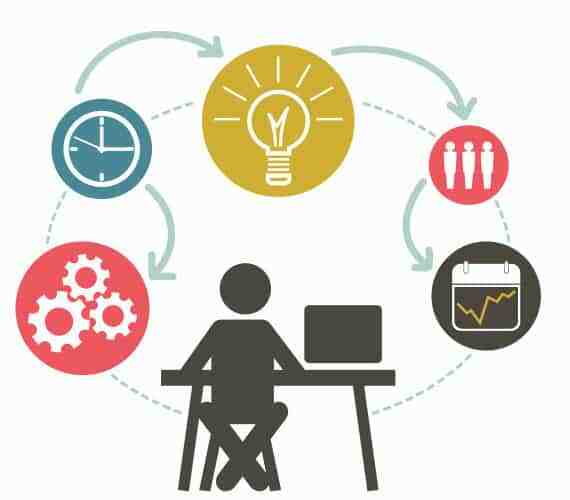 Project management is also broad because it is a “meta-discipline” covering many areas of management including leadership, organizational behavior, organization change, to name just a few. PMO Advisory can customize a longer program for organizations that seek to substantially improve their project, program, and portfolio management acumen. PMO Advisory is one of the few firms that can offer training in Organizational Project Management spanning across project, program, portfolio, risk, agile, and Project Management Office. Please contact us with your detailed requirements and let us astonish you with what we can provide. Experience – By definition experienced, professionals are experienced and knowledgeable. This needs to be considered within the training design and delivery. Value of Time – Time is the most precious commodity for professionals. They need trusted sources for Q&A and not waste time researching. They also are busy – making it difficult to carve out a day or multiple days, especially consecutive days, to study. Limited Attention Span – To optimize learning, most adults also require multi-modals of learning – a blended learning environment to maximize the effectiveness of learning. We designed our Intelicamps to address these principles and optimally deliver the boot camp materials. All Intelicamps are focused (e.g., on passing the certification exam) and modular, commonly at three sessions of 4 hours each. We only use highly qualified instructors who are certified experts in their fields. Intelicamp is blended learning, combining the best of expert-led in a live real-time environment to answer questions with eLearning and large practice exams and exam simulators. Collectively, PMO Advisory has achieved and is sustaining a 100% pass rate on the first attempt across our certification boot camps for those that follow our simple methodology. And the methodology is quite simple: pass our exam simulator at 85% two consecutive times within 7 days and take the actual exam in a week. For more information, click here for “The Big Read” on how our Intelicamp works. Be responsible and accountable for each customer’s success. Always act with integrity and dignity when dealing with customers, vendors and employees. Always EXCEED the client’s expectations.